Wonder Woman, a 15 foot tall pirate, the Ghostbusters, Buddah, Darth Vader, Chihiro, a Gamorrean guard, Jim, Ranger, the Raptor, myself, and 27,887 others attended GenCon 2009 earlier this month in Indianapolis. As first-timers, we did not know what to expect. Despite the fact that my friends were making GenCon widow plans, I lack the graciousness required to jealously listen to stories about the awesome gaming convention. Our preschooler loves games, so we knew he would be amused; our only concern was keeping him from moving players' game pieces. At 9 months, the baby is very opinionated, but she loves riding in the backpack and her patience can now be bought with Cheerios (lots and lots of Cheerios). After our first disorienting minutes in the vast exhibition hall, I wondered if I had made a huge mistake in coming with the kids. Polyhedra rarely seen outside of theoretical geometry labs surrounded me like tribbles, gleaming brightly from row after row of plexiglass bins. My mind flashed back to the first night Jim's cousin brought over Descent. While he laid out the chits, cards, and *blush* statues, I cringed. When he dumped the bucketload of dice required on the table, I balked openly, "Um, guys, I think my ovaries prevent me from playing any game with this many dice." But they needed me for a quorum, so I set aside my derisive comments about "pizza boys" and picked up the biggest battle axe in the deck. I've never looked back. GenCon was no time for second thoughts. We floated through the exhibition hall on a wave of humanity (and alienity). Suddenly familiar sights started appearing in the booths. Memories of great get-togethers (with and without space colonization and zombie attacks) popped up as favorite titles came into focus. Companies I have long admired offered opportunities to talk with employees, ask questions, meet designers, and try new games. Ranger loved playing demo games, Jim grooved on the geek zeitgeist, I liked asking about kids' offerings (and getting good answers), while the Raptor contentedly left a Cheerio trail in case we needed to retrace our steps. Party gamers Out of the Box [earlier review: Apples to Apples] introduced us to some new favorites for kids (and the rest of the family). Playroom Entertainment enticed us with their games for the preschool set. Simply Fun (a home-based consultant company- think Tupperware party) astounded us with their elegantly straightforward Ribbit by master designer Reiner Knizia. Gaming closet favorite Rio Grande came through with a great kids version of Carcassone that works for ages 4 and up (this must-have for Carcassonne fans quickly sold out at GenCon). Winning Moves' Cir*Kis caught both Jim's and my hearts, but we didn't move fast enough to buy a copy before they sold out. While the crowds (especially in the exhibition hall) were daunting with young kids, the attendees and staff made the kids' experience quite good. People were gracious and generous with the baby and very willing to help our preschooler have hands-on gaming time. On the whole, it seems like the people at GenCon welcome kids more than the average crowd. I wouldn't have wanted to navigate the place with a large jogging stroller (it would just seem rude in the limited space of the exhibit hall), but other parents seemed to do okay with infants in mid-sized strollers. If you're going strollerless, take along a large comfortable bag (that you can wear) if you might do any shopping. The vender bags tend to have small hand holes, so something you can sling over a shoulder is valuable. Toting a lot of small gear (changes of clothes, snacks, toys, etc.) that you want on site, but not on hand? Rent a locker in the morning (seriously, they sell out fast) to use as a home base. The lockers I saw were 75 cents to a dollar and only take quarters. You'll need to pay each time you visit the locker, so you won't want to visit too frequently. Kids from elementary school on up could really thrive in this environment. It's exciting and there are lots of games to play. If (or, more accurately, when) we take older kids, I will purchase an unlimited library card ($20) to the GenCon games library. That way kids can try new games and household standards even if there's not much for them in the demos. If we had a group of families with kids going (you know who you are: hint, hint), it seems quite reasonable for kids to game in the library with adults exchanging supervisory time. This trip we stayed with our gracious friend in Indianapolis. While such wonderful free housing would be a fine arrangement for adults, the commute to and from nap time was extended. The skywalk connected convention hotels (there are a number to choose from) seem a great asset with young kids. Not only could the wee ones get better naps, pit stops and snack times would be easier too. Plus, while the kids napped, an adult (assuming more than one are in attendance) could go back to the convention halls for some solo gaming. Our kids would love the opportunities to swim in the hotel pool. The zoo and State Museum would become workable side trips (as we wouldn't be driving around town so much). The event schedule runs literally 24 hours a day, so one parent (or both if they alternate childcare) could still participate even after the kids have been put to bed. For game-friendly teens and tweens, GenCon seems a great playground. The cos play and LARPers give the con a festival atmosphere that's irresistibly offbeat (4 year old Ranger insisted on wearing a cape after our first visit). Adults seem quite willing to give a young geek a place at the gaming table, so kids with interest won't be relegated to the sidelines or simply shopping the hall. GenCon was a great experience for our family, and we are already making plans for 2010. I'm sure we'll have more to say on this year's con and the great games and companies we met there throughout the next few weeks. Nice write up. 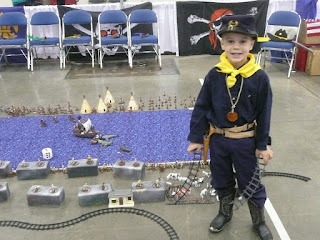 I have been to Gen Con multiple times and always wondered what it would be like with young kids. I know the crowd is not a problem. Most gamers (except for the crusty old grognards) like kids. But it's very "packed" atmosphere. Glad it worked out well for you. Doc- you actually inspired us to go with your stories. It just took almost a decade for us to get our act together. I have at least one friend who has been attending Gencon since she was born.